The digestive process ends with the colon which means if what you eat is not coming out through the colon it is staying in your body. What happens to the left over food that you throw in the trash; it rots and putrefies. You notice this by sight and smell. What would happen if you did not take out the trash for a few years? It’s time to take out the trash that you have been hauling around for years. Did you know that when John Wayne died his colon reportedly weighed over 70 pounds. The colon works with an action called peristaltic motion which basically squeezes the left over food out of the body. From years of eating enzyme-deficient food the colon walls develop build up just like the pipes under your kitchen sink. This makes it hard or next to impossible for the peristaltic action to take place. We keep eating so more food is being pushed through the colon. This can cause bloating, constipation or diarrhea. Besides the direct effect on your digestive tract this process causes illness in other areas of the body. The intestinal tract has pressure points on its surface that coordinate to the entire body. The intestinal tract affects every aspect of the body. Runny nose, blood shot eyes, loss of the ability to taste food, chronic body odor are a few of the minor but noticeable effects. Major problems occur when putrefaction and the proliferation of bad bacteria cause the system to backup. This is when you will see red crystals, candida, yeast and parasites being absorbed into the blood. A good colon cleanse product will move food out of the intestines. It will get the energy flowing through your digestive system once again. You will notice that the feces that are expelled along with any gas will have a more pungent order this is due to the old material that is being passed out. This is a good sign that the product is working. • Severely limit the amount of cooked, processed foods. • Eat as many raw foods as possible. Do a lot of juicing. • Increase the amount of nutritional supplements especially enzymes, antioxidants and vitamins/minerals. • Replace the beneficial bacteria in your intestines. • Rest as much as possible. Don’t stress or over work yourself. 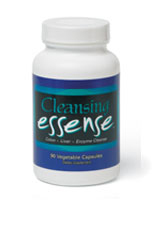 All of the following ingredients are found in the Cleansing Essense product. of undigested sugars that will ferment in the intestinal tract. Lactase- (Aspergillus oryzae) 900 LACU. Aids in the breakdown of lactose. It is our belief that complete intestinal cleaning can only come through colon irrigation. This is a process that will complete the process you have started with the oral cleanse. If you are interested in more information see the books listed in the reference section. A healthy and properly functioning liver is vitally important for optimal health. The liver is responsible for performing hundreds of different tasks. Here are a few of those. If we wish to support the liver on a daily basis there are some things we need to implement into our routines. Let’s look at a few of them. • Eat less protein. This is the single biggest source of stress on the liver. Also, buying organic meat will alleviate stress because of the lack of steroids and antibiotics. • Drink less alcohol. This inflames the tissues of the liver and causes it plug up. Long-term usage will lead to cirrhosis. • Eat more organic fruits and vegetables. The pesticides and herbicides found in non-organic foods are increasing and have to be filtered out by the liver. • Cut back on drug usage of any type; it has to be filtered out through the liver. • Eat less cooked, processed foods. Foods that are enzyme-deficient stress the liver. If you eat these types of foods add a digestive enzyme. • Exercise on a daily basis. Toxins are released through your sweat and perspiration which will relieve your liver from having to do all the work.